With the passing of Dr. Guthrie, the first and most important era in newborn screening has come to a close. Although no innovation in medicine stands by itself – all are built on previous or current discoveries – the development of newborn screening by Guthrie comes as close to being truly unique as a discovery can possibly be. Everything in newborn screening that has come since the Guthrie test and that is yet to come has been and will be built upon that rock. This can be safely predicted as well for all future mass population screening. Dr. Guthrie died in Seattle, Washington on 24 June 1995 after a long battle with heart disease and Parkinsonism. He and his wife Margaret had moved to Seattle from Buffalo, New York only a few weeks before to be close to their daughter, Barbara, and her family. Following are tributes to Dr. Guthrie. The first and certainly the most important is the memorial of Prof. Dr. Horst Bickel, whose discovery of the diet for PKU made the Guthrie test possible. Dr. Bickel clearly shares equally with Dr. Guthrie in the development of newborn screening. Dr. Kenneth Pass, Director of the New York State Screening Program, was as close professionally and personally to Dr. Guthrie as anyone during the past few years. Dr. Brad Therrell, President of the International Society for Neonatal Screening, was also close to Dr. Guthrie for many years. Both of your Editors-in-Chief had long and very close associations with Dr. Guthrie. However, this tribute would not be appropriate if it did not include recollections from the Guthrie family. Patricia (Paddy) Guthrie kindly wrote about her Dad for her Mom, Margaret, and her siblings Anne, Barbara, Thomas, James and the late Johnny, who had non-PKU mental retardation and was so important in Dr. Guthrie?s developing a test to prevent mental retardation. We know Bob would have no difficulty recognizing himself from any of these recollections! Used with permission from Elsevier Science Ireland Ltd. All rights reserved. During an invitation from Dr. Rubin to the Children?s Hospital in Buffalo in 1959, I met Bob Guthrie for the first time. Some years before, Evelyn Hickmans, John Gerrard and I had described our first attempts to treat phenylketonuria with a diet low in phenylalanine (1953). We suggested that the best results would be achieved if the therapy was started as early in infancy as possible. What was needed for such an early diagnosis was a screening test within the first week of life for every newborn infant in the population, at an age too young for a clinical diagnosis. At that time there was no screening test that could meet these preconditions. Bob Guthrie, in a highly technical and complicated manner, tried to explain to me his bacterial inhibition assay which he had just started to adapt for a simple and sensitive phenylalanine assay in a drop of blood. As a clinician, I understood very little of his eloquent account but after careful reconsideration, I returned some days later because I agreed with Bob that this might be a suitable method to permit massscreening for PKU in large populations. After I had returned to Germany in 1961 Bob Guthrie was most helpful in establishing a screening center at the University Children?s Hospital in Marburg. In fact, when we encountered the first difficulties he came over with Ms. Susi, his technical assistant, and with his test kits to give us very valuable help. In 1962 we were ready to set up the first bacterial screening center in Germany and, actually, in Europe. With great organizational difficulties we started to collect blood specimens in Hessen, Hannover and Bremen on Guthrie?s ingenious filter paper cards. Quite in accordance with Bob?s aims and with his active support we endeavored to spread the screening gospel and method all over Germany, to other European countries and to countries beyond Europe, such as Japan. In Marburg and, after my move, in Heidelberg, Bob and I had several small meetings and larger congresses which Bob stimulated greatly with his enthusiastic approach and also with practical help and advice. Drs. Thalhammer from Vienna and Naruse from Tokyo were some of the many visiting friends profiting greatly from Bob Guthrie?s expertise not only in the screening of phenylketonuria but also in screening for other inborn errors such as galactosemia, maple syrup urine disease, homocystinuria, histidinenia and hypothyroidism. Beyond screening, Bob acquired a remarkable knowledge of the clinical picture of these diseases, especially, of course, of phenylketonuria. Nine international screening symposia were initiated by Bob?s strong impulse to promote screening all over the globe from Warsaw to Texas, from Brazil to Tokyo and Sydney. Already in 1979 at the Symposium in Heidelberg, it became obvious by the presence of individuals from many countries that international centers were already conducting newborn screening, covering an ever larger portion of the world by this new means of preventive pediatrics. Bob Guthrie was not only a restless organizer in the matter of screening, but also a rather unique personality. He was so obsessed by the idea of finding the cause of diseases in trying to prevent them that he tended to become increasingly insensitive to other matters. As soon as he arrived, the telephone had to be free for ?metabolic? long distance calls to Austin, Sao Paulo or Zurich. Ninety minutes before taking off at Frankfurt airport, for a long distance flight, he stood still at the window in our home admiring some new slides for his next lecture. During a lovely car drive along the Rhine and Mosel rivers, neither Thalhammer nor I succeeded in changing Bob?s conversation to ancient castles or different German or Austrian wine growing techniques. This complete identification of all his thoughts and considerations with his activities in research made his company somewhat strenuous and tiresome but always instructive and productive. I was fascinated by his aggressive but still deeply humane approach in trying to help suffering children and their families, especially their mothers. I cannot yet grasp that this brotherly friend will not be available any more for an amicable exchange of views dealing with our many mutual interests. Also, the loss for people all over the world trying to set up or improve screening techniques will be irreplaceable. The first time I heard the name ?Guthrie? was in 1967 when I was in the office of Dr. MacCready, Director of the Diagnostic Laboratories at the Massachusetts State Laboratory Institute. Dr. MacCready and Dr. Guthrie had a close relationship. Both had retarded children and Dr. MacCready had been instrumental in getting the Guthrie test going by developing the first universal newborn screening for PKU in Massachusetts when Dr. Guthrie could not convince others that PKU screening was worthwhile. It was the early results reported by MacCready that gave Guthrie the ammunition he needed. Dr. Guthrie called Dr. MacCready at least once every other day to discuss newborn screening and, as many of us can attest, Dr. Guthrie was not to be denied, on the telephone or anywhere else. These lengthy conversations were never easy for the taciturn Dr. MacCready. At about 16:4S h that afternoon the phone rang and it was Bob Guthrie. Dr. MacCready said a couple of words, then was silent until 17:00 h when he suddenly hung up. Later, I learned that to avoid the inevitable hour or much longer telephone conversation, Dr. MacCready would tell Dr. Guthrie he would not be available before 16:45 h, knowing full well that when the central switchboard at the laboratories closed at 17:00 h, all phone lines shut down. I do not know whether Guthrie ever caught on to the game, although little ever passed unnoticed by Guthrie, but I do know that it maintained MacCready?s sanity. It was this persistence that enabled Guthrie to accomplish what I believe to be one of the great achievements in the history of medicine. PKU screening is correctly identified as having prevented mental retardation in tens of thousands of children. What is not fully appreciated is that newborn screening has dramatically altered the concepts of both public health and genetics. No longer is public health viewed as only addressing infectious diseases and preventing epidemics. No longer is it possible to discuss the implications of the ?new? genetics and genetic research without including genetic screening and public health. And it is impossible to seriously consider genetic screening without discussing PKU screening, often at the beginning of the discussion. Despite much opposition to PKU screening, especially to mandatory screening, Guthrie won the day. Abraham Lincoln said that genius disdains a beaten path, that it seeks regions hitherto unexplored. Guthrie frequently said that he came naturally by his persistence and his compulsion to travel. His father, he said, was a traveling salesman. The first article in the 1992 inaugural issue of SCREENING was appropriately by Dr. Guthrie. In this article, he described how newborn screening began, characteristically paying tribute to those who aided him along the way. That article should be required reading for every geneticist, physician, public health official, legislator and most everyone else, for it tells us what medicine and medical research should be about. Of course, the article does not say much about Guthrie himself. Not that he was modest. He let you know that the PKU test was his discovery. It was just that he thought of himself largely, if not exclusively, in terms of the Guthrie test. So he never told us that he held three bachelor degrees and two master degrees, that he received numerous prestigious awards and, most importantly, that, like Einstein, he was a sailor. Bob never forgot where he came from. He also never forgot those less fortunate than he. I suspect it was his concern for others, especially the mentally retarded, that sustained him during the early days of his test, when he seemed so alone in advocating its use as a public health measure. Like the Ancient Mariner, ?He prayeth best who loveth best all things both great and small; for the dear God who loveth us, He made and loveth all.? Bob would agree with that. I first met Bob Guthrie in 1972 at an international meeting in Poland. This was one of the biennial or triennial small gatherings of international figures in newborn screening that Bob organized with funding from the US government. I had already started regional newborn screening in Japan but I needed to hear directly how newborn screening was conducted in other countries, to meet those who were in the forefront of newborn screening but, most of all, I needed to enlist the aid of Bob, who already was a famous person throughout the world. When I met him I realized that if he came to Japan to lecture about screening and instruct us in how we should develop screening, it would be much easier to convince those of influence to support the development of nationwide newborn screening in Japan. Fortunately, Bob was very enthusiastic about expanding newborn screening to Japan. Of course, Bob was always enthusiastic about any expansion of newborn screening but I believe he was very impressed with Japan and saw an opportunity in Japan to realize his dream of directly joining newborn screening to the medical diagnosis and care of the identified infants. In 1974 he visited Japan and, as I anticipated, he had enormous influence. In 1975, the Japanese government decided to begin nationwide screening. The time of initiation was set at October 1977. Meanwhile, we were concerned about the ability of the screening laboratories to properly prepare the bacterial inhibition assay. Consequently, we decided to have a course for technicians and to invite Guthrie to give the course. However, the date set for the course was late in December of 1976, overlapping the Christmas holiday time. We hesitated to ask Bob to leave his family and come during that time. Nevertheless, we did ask and he not only accepted but insisted that he participate in the course until 2 days before Christmas. Certainly, many reading this will recall their own experiences with Bob?s extraordinary dedication to furthering newborn screening. He was an excellent teacher and was always very kind and patient with each of the 100 participants. Bob came to Japan several more times. He always accepted our invitations. In May 1993, despite severe back pain, he came to Sapporo for the annual meeting of the Japanese Society for Mass-Screening where we made him the first honorary member and presented him with a silver replica of a yacht. We thought that all sailors should have a silver yacht! As he did in so many places throughout the world, Bob brought us much screening beyond PKU. He introduced us to a new screening test for congenital adrenal hyperplasia (CAH) shortly after a report was published by Dr. Pang describing this new test. After hearing about this in one of his lectures, many people in Japan became interested and began to research an enzyme immunoassay method for CAH screening. In the case of congenital hypothyroidism (CH), he organized the first international meeting on screening for this disorder in 1976 and promoted an international committee that played a key role in the development of CH screening throughout the world. 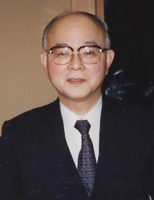 His influence in newborn screening in Asia did not end with Japan. He visited China twice and was instrumental in the development of newborn screening in Beijing and in getting ?low phenylalanine milk? to Beijing and Shanghai. He did the same for newborn screening in Taiwan. Not long before his death, Bob asked me about the possibility of initiating nationwide screening in Korea and countries in East Asia. When I told him about preliminary screening in Korea and Thailand, he wanted to visit these countries to encourage screening. Many people in Japan and throughout Asia knew Bob and were impressed not only by his excellent scientific work but also by his very warm personality. It is very sad to realize that he will not be coming to Asia again. He will be greatly missed. I remember the first time I met Bob Guthrie. It was at Los Angeles Children?s Hospital in 1979. He was discussing the possibility of expanding newborn screening to include hypothyroidism and other disorders using an innovative four sample punch index machine along with newly developed screening assays. It was an interesting meeting and I was extremely impressed with Bob?s presence and his tenacity in pushing for expanded testing. Not long afterwards, Bob visited our health department, this time as a guest to discuss expanding the PKU screening program to include multiple disorder testing. He was somewhat apprehensive at our plans to screen 300,000 infants in a single laboratory but seemed impressed with the scope of the project and eventually agreed that it was the quality of the lab, not the size, that was paramount. It was during our first lunch at a local steak restaurant that I learned that Bob was a vegetarian. He chose the salad bar and gathered a few small green peppers to decorate his plate. After awhile, I noticed that he suddenly stopped talking, a bit unusual given his desire to sell our screening program on expanded testing. Then I saw that he was rapidly gulping down a glass of iced tea and it was then that someone explained to him that Mexican jalapeno peppers were not the same as the peppers he was used to at home in Buffalo. We all had a good laugh. Time seemed unimportant to Bob; innovation and improved methods of helping prevent health problems were his primary objectives. Once while staying at my home I was surprised when, at close to midnight, he asked to use the telephone to contact a colleague regarding a thought that had just crossed his mind. I was equally surprised when on several occasions he also phoned me late at night to review screening statistics just prior to leaving for a visit to some foreign country to extol the virtues of screening. The telephone was his ally and he wasn?t shy. Bob never hesitated to use it to request information or financial support when screening was the issue. If you really think about it, it was Bob Guthrie?s energy and his desire that eventually led to our international society. While Ian Lyon initiated the idea of an organized group to publicize our screening accomplishments and unify our approaches and Hiroshi Naruse provided the organizational skills that got us moving, it would not have happened without Bob Guthrie?s concerns about preventing mental retardation and his ideas for ways to expedite sample collection, transport and testing. It was his intelligence and his purpose that developed this essential area of public health medicine, newborn screening, in which we participate today. 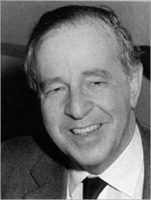 The International Society for Neonatal Screening will always be indebted to Bob Guthrie as the founding intellect of an area of preventive medicine that was important enough to span the globe and bring us together with one purpose – preventing mental retardation and unnecessary death through early disease detection and treatment. It won?t be the same without Bob, his blue shirt, his bolo tie, his camera, his sailboat picture, his slides and his ?short? comments at meetings, but we?ll always remember his devotion to duty and his success in newborn screening. He was a great scientist, a loving husband and father and a good friend. To Bob, ?Fair Winds!? I last shook his hand on 24 April of this year. The old grip, firm and reassuring, was not there. No smile could be coaxed from among the weathered sun lines on his face. From his eyes I could extract no acknowledgment of me or my presence. There were hundreds of people in that SUNY hall in Buffalo, all wearing name badges imprinted with a small foot – only he wore a string tie. They were there to pay their respects and heap praise on this man as he received yet another award, this time the prestigious Heritage Oak Foundation Founder?s Award. Margaret sat at his side, always courteous, always smiling, making the necessary small talk while he remained silent. On a nearby table were mementos of an active, productive life: previous awards, photos with other pioneers in science and medicine, relics from travels throughout the world and hand-written notes of thanks – scores of them – from his ?PKU family?. Later, after the speeches and toasts and awards, with very little indication that he was a participant in the affair, his daughter Patricia walked over to him, handed him the microphone and asked if he?d like to say a few words. Immediately, miraculously, time and its insults retreated; it was years earlier; it was another scientific conference and Dr. Robert Guthrie was lecturing on the history of newborn screening and its importance in public health, all the while minimizing his own role in its success. Sweet deja vu. It?s not easy, not yet, to reflect on the many times I worked with Bob. As others have noted in these pages, those interactions were not always easy, but, in hindsight, they were always instructive. I recall once (I believe it was in Raleigh) when, as chair of a conference session, I recognized a questioner in the rear of the hall. As the familiar voice began interrogation of the hapless speaker, I couldn?t resist the temptation and interrupted, ?Sir, please state your name for the record!? Caught completely off guard, Bob stopped, stared at me for a moment, laughed heartily and then said distinctly for the millionth time, ?Guthrie, Buffalo.? And continued his question. I treasure that memory and its lesson in humility. I feel fortunate to live and work in the state which can call Bob its own. When I lecture in the School of Public Health or in Grand Rounds around the state I always use a slide of Bob taking a heel-stick specimen. 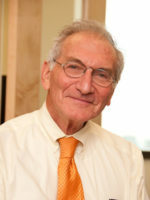 With that image of pediatrician/scientist and tiny baby on the screen, I take the opportunity to tell all within earshot that New York is the home of Dr. Robert Guthrie, Professor Emeritus, SUNY-Buffalo and the ?Father of Newborn Screening? ; that it all began in Buffalo, helped immeasurably by Johnny, who never knew; and that we should be proud of this heritage and make it known whenever possible. Of course, Bob would not approve of such talk. During a 1991 international meeting on newborn screening in the Blue Mountains of Australia, we were taken to a station, i.e. ranch, for lunch and to see the kangaroos, wallabies and other indigenous attractions. We were also given a demonstration of the art of sheep shearing. A wiry old rascal, recruited from a nearby station, provided the exhibition of sheep denudement. After the demonstration, several of us, including Bob, were talking with the fellow and answering his questions about this group of scientists, when he asked Bob who he was and what he did. In his usual modest way, Bob said something to the effect, ?I?m just a retired biochemist.? I think it was Judi Tuerck who interjected that Bob was much more than that, then told the shearer that Bob was the ?Father of Newborn Screening? and started to explain to him what newborn screening was all about. The sheep shearer abruptly stopped her and said, ?No need for that. I know all about it [newborn screening]. My granddaughter has PKU.? That?s when I took a picture of these two elders, arms across shoulders, living worlds apart, but forever united in spirit. Amazing Grace. Self-interest was never a factor in Bob?s actions, but ever present was the pressure of his unrelenting drive to perfect the newborn screening system and expand its reach. Among all his accomplishments, it is the dried blood specimen, the DBS, the filter paper specimen, for which I have heard Bob express a wish to be remembered. The BIA tests he devised, still used for detection of PKU by New York and many other screening programs throughout the world, undoubtedly will be replaced by technological advances; Bob himself told us that many times. But the Gufhrie Spot will remain as the specimen type for newborn screening into the far distant future. I think we do Bob just honor when we refer to that specimen as the Guthrie Spot. During the first 30 years of newborn screening in New York, more than 8 million infants were tested for PKU and six other congenital conditions. In that time more than 6000 infants with one of the conditions in the screening profile were identified and referred for medical care; among them were 453 infants with PKU. Many of those 6000 infants are today productive members of society because of the New York newborn screening program. Perhaps through support from the Guthrie Scholarship Fund, one of them might even continue this work. In any case, it is they, and the tens of thousands of such others worldwide, who are the real legacy of this man. And so, Bob, on behalf of all of us who had the privilege of knowing you, calling you friend and learning from you, I say, ?Thanks.? On behalf of all eight million new New Yorkers and the many other millions of newborns throughout the world who have received newborn screening and thereby benefited from your vision and determination, I say, ?Thank you?. And on behalf of all the infants yet to be born and the countless lives which will owe their success, indeed their very being to the Guthrie Spot, I say ?Very many thanks from all of us.? Thanks, Bob – and fair winds. We are now five children. My Mom and Dad, Margaret and Bob Guthrie, had six children, but Johnny died 7 February a few months before Dad. Johnny was retarded (not with PKU) and was a great influence in my father?s development of the PKU test to prevent mental retardation. Another inspirational person in my father?s life was Margaret Doll, my mother?s niece. She was born in Minneapolis in 1958 shortly before Dad perfected the dried-blood spot for newborn screening. Dad told me he would never forget the day he got a telephone call in 1961 from his sister-in-law, Mary Lou Doll, at his Buffalo laboratory: ?She said, ?Bob, I think my daughter has just been diagnosed with what you?ve been working to prevent – PKU.? To me, that was just incredible,? he said. Unfortunately, Margaret Doll has lived a life of profound retardation and only in recent years has her behavior improved with a strict PKU diet. For our family, Margaret Doll was the fact of PKU. We knew from her what it meant to have this disease that Dad so devoted himself to and that took him away from the normal routines of ?fatherhood?. At Dad?s memorial service, 1 July 1995, we recalled many things about the man we called Dad, but others called the Father of Prevention. We remembered how focused and relentlessly hard-headed he could be, whether talking non-stop at home about his work, or trying to persuade us to his political views. We recalled his great love of sailing and his Captain Bligh-like commandeering. Since he was most at peace – or at least somewhat quiet under the sails – we later scattered his ashes from two sailboats on Lake Erie and Lake Ontario. We recalled how busy he was, always on the phone, or at the laboratory or running late to the airport. How he returned home from his travels loaded down with gifts from faraway lands for his six kids: wooden carvings from Africa, tiny dolls from Japan, funny clothes from Brazil. But we also recalled how, despite his busy life, Dad found time to take us camping, or sailing or to his lab to learn what it was he did with those weird white rats. He came to scout meetings, fought for his beliefs about public education and sat in the stands at our basketball and baseball games. And most importantly, through how he lived his life, Dad showed us the lessons of empathy, determination, hard work, dedication and how to give a damn. In each one of us are these traits and we are passing them on to Bob and Margaret?s seven grandchildren. On 24 April 1995, Dad was honored with a tribute and dinner in Buffalo by the Heritage Oak Foundation thanking him for his life-long commitment to preventing mental retardation worldwide and for his local efforts to assist those with retardation. The dinner was named ?30,000 Thank Yous? to link the number of lives his PKU test has spared from retardation in the past 30 years. Our hearts all collectively burst when Dad was presented with The Founder?s Award, a crystal Buffalo statute, by Nick Crimarco, a 9-year-old boy from Long Island, NY. Nick has PKU, but unlike Margaret Doll, he is as every bit as ?normal? as any other kid with a brushcut, a Buffalo Bills? T-shirt and a love for the latest kid craze – Pogs.